If you’re here straight from the last update, read on. If not, best to read that first by clicking here. We’ve established that this CTR has a turbocharger, which means it’s the most economical Civic Type R ever, but also that it’s missing the near-legendary VTEC zone of CTRs past. And given that was for many, including me, the best part of the whole Type R experience this is quite sad. I happen to love how far petrol turbocharging has come over the last decade or so, giving even the smallest capacity engines bark, bite and efficiency, and to the extent that they’re eating into diesel sales. Another bonus. The VWG 1.5-litre TSI engine is my favourite engine, pound-for-pound, in the world. And actually, taken in isolation, the 2.0 turbocharged petrol in the CTR here is an absolute peach. The problem is (and stick with this), that it’s almost too slick. It’s impressive enough that Honda has managed to squeeze 150 horsepower per litre from its VTEC engine, but that it’s done it so smoothly is staggering. There’s proper power right across the rev range in this thing. The problem I have is that it’s also slightly charmless. There are few fireworks either from the engine bay itself, nor from the car’s ridiculous triple tailpipes. By contrast, the Hyundai i30 N, for example, has the sort of burbling, popping, firecracker exhaust note that’s a feature in itself. (Here's our video review of the N.) The CTR sounds…boring. Just slightly louder than the average hatchback, basically. As modern engine bays go, this is one of the best like. The second thing is that it doesn’t really come alive until 50-60mph. The way it accelerates beyond that is astonishing. Weirdly, Honda won’t give us any in-gear acceleration times but they have been done elsewhere, and it transpires the CTR will hit 100mph in 11.9 seconds, and does 40-60mph in fourth gear in 3.1. And in fifth, 50-75mph in 5. The problem there, of course, is that mostly these aren’t the sort of speeds much good to anyone on the road. 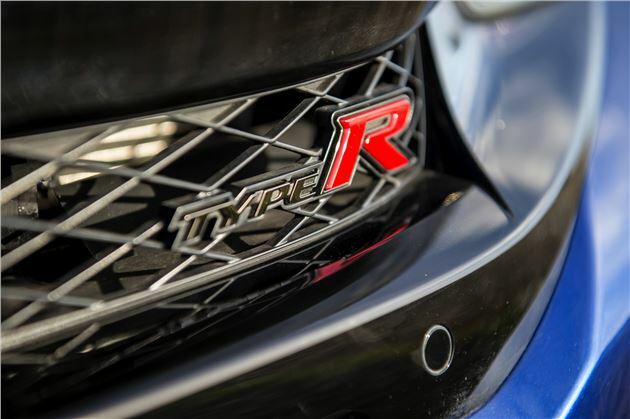 These stats tell you exactly why the Civic Type R is great on a track, and a Nurburgring lap record holder - high-speed relentlessness combined with otherworldly grip. Sadly, back where we all live, CTR drivers like me are losing a traffic light battles left, right and centre with other quick hatchback owners: the VW Golf R, Ford Focus RS and BMW M140i all ruin this to 62mph. And it's a double embarrassment given how Honda has chosen to dress the Type R.
Obviously I’m not advocating traffic light racing (I hate all that stuff, honestly, and never do it), but I’m saying that this Civic Type R has neither the low speed thump – the off-the-line urgency – that you want in a car this mad, nor the old VTEC fireworks. It has proven that it can keep up with genuine supercars at the track stuff, but personally, I'd trade some of that for it being that bit quicker off the line, and that bit louder all the time. These things are relative, of course – your average hatchback owner would, I’m sure, drive a CTR for the first time and consider it an absolute rocket ship. What I’m saying, though, is that I just wish the CTR’s engine matched the drama of the bodywork during the day-to-day stuff. It doesn’t, quite. « Earlier: Missing: one VTEC Zone. Sad face. 23 January 2019: Missing: one VTEC Zone. Sad face. The Civic Type R's 2.0 turbo engine is a marvel of engineering, but it somehow doesn't quite hit the spot. 1 January 2019: The world's worst infotainment system? If the Civic Type R is an astonishing performance car, as a hatchback it's underwhelming... and for some that could be a big problem. The Civic Type R is part supercar, almost, and part family hatchback. It's amazing at the first role. Here's why. We've replaced family transport chalk with cheese, saying goodbye to a Volkswagen SUV and hello to this mad thing.